Gary was born and raised in Kalispell,Montana, hence his great interest in the outdoors. He is also a musician: has a great tenor voice, plays guitar, and directs the choir. Gary did his undergraduate work at Northwest Christian College (now University), Texas Christian University and the University of Oregon. He received his Master of Divinity from Claremont School of Theology. Gary has served churches in Montana, Oregon, and California. Besides his duties as pastor at First Christian Church, Rev. Shoemaker serves in many capacities with the Regional Christian Church. He also serves locally on the United Ministries in Higher Education at Western Washington University and participates in many local outreach projects. Pastor Gary is married to Tamalyn Kralman, our Associate Pastor. Their daughter Brett is currently studying nursing in Kentucky, and son Zach and daughter-in-law Megan and their little ones, Benjamin, Emmett, and Rowan, live in the Bellingham area. As a 5th generation Disciple on both sides of her family, perhaps it was inevitable that Tamalyn was born, raised, educated, and ordained Disciple. Following in her parents' footsteps, she did her undergraduate work at Northwest Christian University and the University of Oregon. Following in her husband's moving van tracks, she did her graduate work at Claremont School of Theology. Because of her love of church and a fascination with the process of faith formation, she earned a Master of Arts in Religious Education, completing extra coursework for ordination. She and Gary were ordained together in July of 1986. 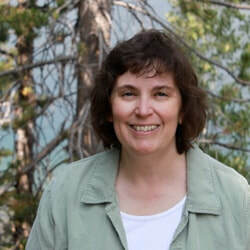 Tamalyn has served Disciples, UCC, ELCA, and PCUSA churches in Oregon, California, Montana, and Washington. She is happy to be, once again, working with her husband and serving a Disciples congregation and is loving her new favorite role as Grandma. Amelia came to us in August 2012. Serving as our accompanist for Sunday morning worship and other special services, Amelia's gifts on the piano add beauty and spirit to worship.